Three striking buildings have been recognised at the Society of Façade Engineering (SFE) Façade of the Year Competition 2018. 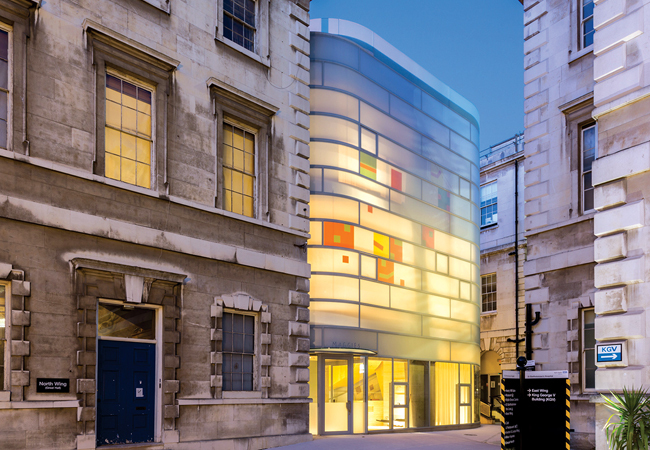 Arup Façade Engineering and Sir Robert McAlpine won the Innovation award for Maggie’s Barts. The Refurbishment award was won by Arup Façade Engineering, for the University of Leicester’s Engineering Building, while BuroHappold Façade Engineering took the New Build award for the Louvre Abu Dhabi. The SFE Façade of the Year Competition, now in its sixth year, is the façade industry’s longest-running and most prestigious awards. It recognises and rewards excellence and achievements in the field of façade engineering, and draws attention to the importance of façades in modern architecture. This year’s judges said that each of the winners had succeeded in achieving facades that are diverse but equally remarkable. It is more important than ever, they added, to celebrate the achievements of the award winning entries and their contribution to façade engineering. The winners were announced in December at the Glass Supper.